I like Danny Gregory's books on sketching. They are always lively and inspiring. I've every single one of them since his first book on drawing, The Creative License. In some ways, Art Before Breakfast feels like a sequel to that. Art Before Breakfast is a book on drawing with lots of ideas on what you can draw, a few techniques you can try out and suggestions on where you can find time to sneak in a drawing or two on your sketchbook. The tone is enthusiastic and motivating. The example drawings are accessible and fun. Nothing too daunting and the challenge is to move your pen. This is also a book on the virtues of drawing and Danny Gregory has included many of his personal thoughts on drawing that are bound to inspire. This book works great as one you can pick up from time to time, flip to a random page to read and recharge your creative cells, and to find something to draw. I like the tips on random techniques, such as mixing media, and there are different ways on how you can approach your drawings, using reference, creating themes, silencing your inner critic and more. Those who already know the basics of drawing, observational drawing, will get most out of the book. There are some introductory drawing lessons though, such as contour drawing, spotting negative space and using measurements. I feel that if you're a beginner who knows nothing about drawing, those introductory lessons may or may not be enough for you because they are rather brief. So if you're looking for a book to learn how to draw, this is not the appropriate book. This is a what-to-draw book. 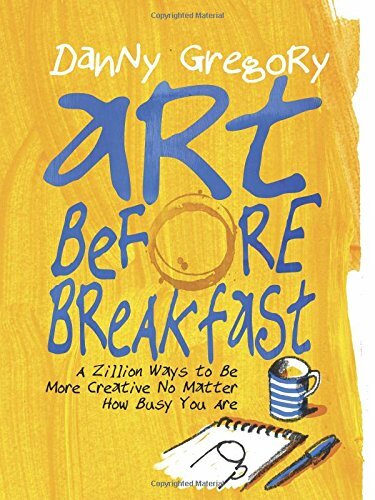 Just like other books by Danny Gregory, I enjoy this book and would like to recommend it to anyone looking for inspiration and motivation to draw. And if you want to learn drawing, I recommend Keys to Drawing or Drawing on the Right Side of the Brain.